In January 2015 I wrote a blog post about how to stay on top of housework and give each room a touch of your own personality without becoming overwhelmed or wondering 'where do I begin?'. I came up with a simple idea called "Walking the Room" and it involved a master planning sheet (which I offered as a free print out) and taking some time to walk through each room of your home and writing down all the changes you'd like to make, chores needing attention, what you want to remove and basically any other ideas or plans you dreamed of doing. 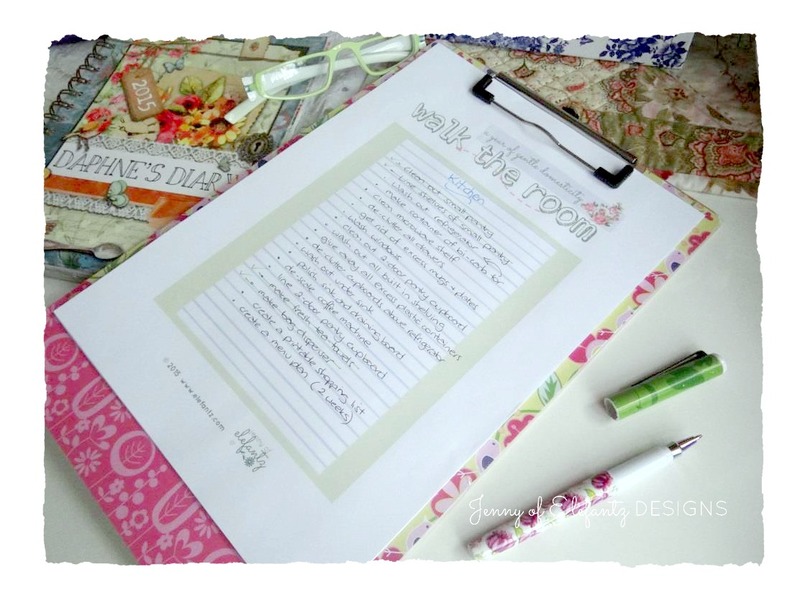 "With an entire year to immerse my soul in the domestic arts ahead of me, I've been meaning to fill my diary with all my 'home-centred' ideas so I don't forget them, but...I keep forgetting to write them down. Another thing that stalls my good intentions for bringing some domestic control to my home is feeling overwhelmed by the amount of work I see before me and simply not knowing where to begin...."
Even though I was not renovating a neglected Tuscan villa, I did desire to make every room in this rental house a place of 'welcome' and refreshment, a sanctuary, so I decided Frances had sage advice for me to draw from that year. One room at a time, politely re-acquainting myself with it's nuances, I wrote myself notes about the things I needed and wanted to do with the house to fulfil my hopes. And that's when I prepared the first very simple "walk the room" planner page. ...and I found this to be the most wonderful way to remember all the new ideas which filtered through my mind as well as keeping me on track with the bigger picture. There was no time limit either as I did not want that pressure added to already full days, but this way I could look over my Walk the Room sheets each day and see if there was something I could do in whatever time I had free - which could have been 10 minutes or 4 hours. The sense of satisfaction as ideas or chores were completed and accomplished over the course of that year was wonderful! Now here I am two years later and ready to Walk the Room(s) of my home again so I wondered if you'd like to join in? ...plus there's also a second sheet which is empty so you can sketch in any room re-arranging plans too (something Blossom enjoys doing). 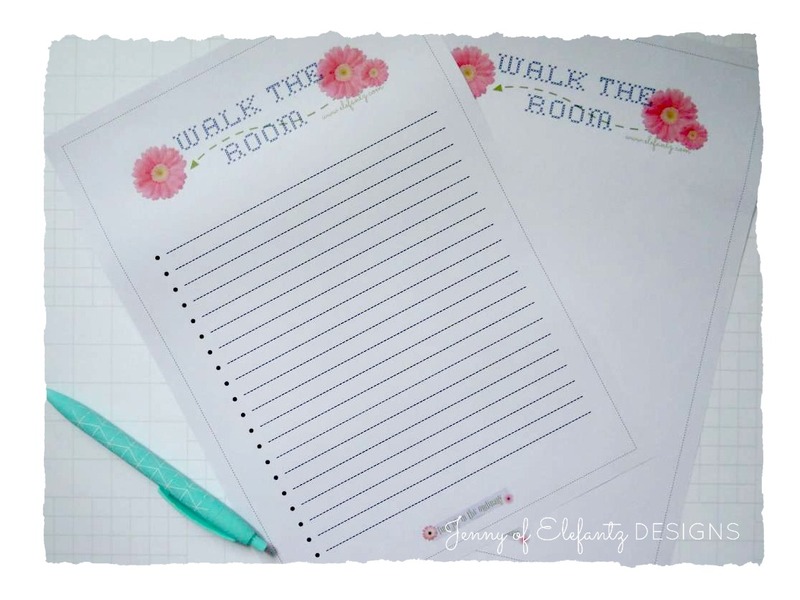 You're welcome to download the free set of "Walk the Room" planner pages HERE. At just 12" long it was filled with freshly laundered handkerchiefs and cost a mere 50c. I showed Blossom, who was with me at the time, and she was as astounded as me. Of course I tucked it close to my chest along with the books I'd found and after paying for my purchases came home rather chuffed. I've popped a mini quilt hanger inside to display it properly and will fill it with my countless other orphan handkerchiefs when I gather them from the many hiding places they've been stashed away in. The little hanger is hand made which made me ask "where did you come from?" as I hung it for the photo...naturally I received no response, but I'm sure it has a story to tell. How do you store hankies? A little hanging bag like this is a rather cute idea. Our current chat topic in the Gentle Domesticity FB group is about sharing simple ideas or strategies for de-cluttering a home or room. The change of season is a perfect time for sifting through what we have and moving some things along which no longer serve a purpose, do not reflect our style, or have simply become too much. Even if you're not a member of the FB group I'd love to hear your ideas in the comments below as would many other readers I'm sure! Visit the Gentle Domesticity Group here. Have a blessed and joy filled weekend dear friends! We've been assured by the Bureau of Meteorology there's a cyclone on the way which will probably make land somewhere along our northern coastline on Monday morning so I've stocked the pantry and Mr E will secure everything in the yard tomorrow morning. I pray no-one is hurt and no property destroyed, wherever it lands. Hope the storm isn't too bad. Enjoy your weekend. And thanks for the printable. Oh dear! I must keep an eye on that cyclone. My brother and sister in law are heading off to Rockhampton from the Gold Coast. Hope all is well up your way. I have never seen a hankie bag like that before. My mum loves her hankies but I don't think she has a hankie keeper. Hmmmm, now there's an idea for Mothers Day! Decluttering, LOL, I am having enough trouble trying to clean out one drawer a week. By the time I am finished I have to start on the first one again. My sewing room is a big problem. I am in awe of the way your sewing room is kept so neat and tidy. Your new hankies and their little bag are sweet. :) I have been thinking lately of going through my house and asking, if I had a limited amount of money after a house fire, would I replace _________? Maybe that would help me narrow down my favorites in some of the areas that I keep too much. I added you to my planner so I would remember to pray for you this weekend. Thank you for your posts. They always encourage me! I have never heard of a hankie bag before. I immediately thought of clothespin bag when I first saw it. Already filled with nice hankies for 50c is a bountiful blessing. I store mine folded in a bureau drawer. Thank you for the updated printable. I thought about this the other day when my hubby and I were just talking about the different rooms in our house and what we would like to do. I will be praying for you and everyone else in the path of the cyclone. Hello Jenny! Your Hankie Holder is so cute and you did get a special buy to be tickled about. 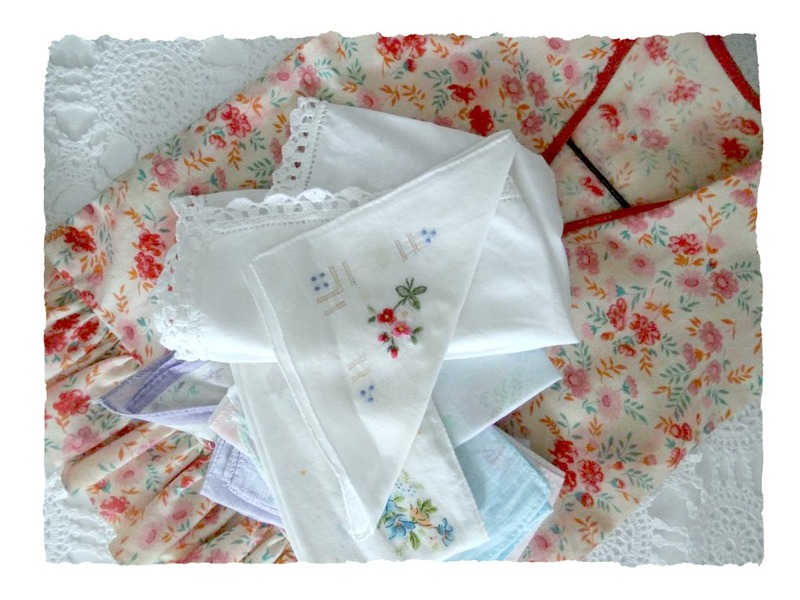 No one I know uses hankies any more but it sure would make a great gift for someone who does! Hubby and I, both being disabled, take care of the house and the outside chores together. Which is really a great way for us, we recently began a notebook filled with a daily priorities list and it does great some days and some days not so great. I will discuss with him your suggestion and see if he would like to give it a try. I will be keeping you and your family in my prayers along with others who will be facing the Cyclone. May the Lord watch over each and everyone of you! Walking the room is EXACTLY what I need right now. With 2 weeks holidays at home (yay!) this will keep me focused. BTW - I just love that movie too. 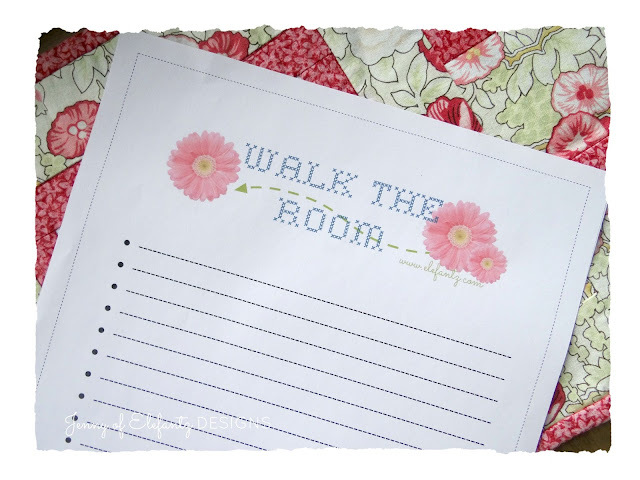 Now that walk the room will come in handy as almost every room in the house needs something doing. Thanks for the idea. Love the hankie bag. My hankies are all over too. Ha, ha, declutter tips? From me? Not likely. LOL This is the bane of my existence. I either need a permanent secretary following me around (okay, a robot would do perfectly! ), or I need a house twice this size. AND a robot following me around! That is a darling little handkerchief bag, and I can't believe it came so inexpensively! Hi Jenny, I absolutely love your op shop find of a 'Hankie Bag'. I can recall my maternal grandmother had one, and it was always filled with neatly ironed hankies (I actually had my first ironing lesson on ironing my grandfathers hankies) and he also had a a very masculine checked hankie bag. 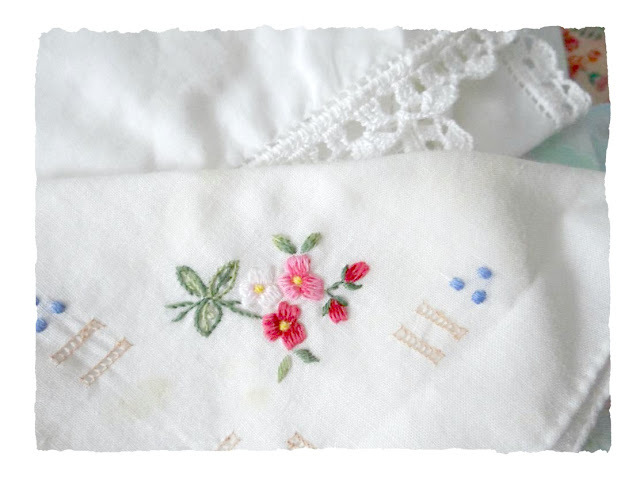 Whist I have some of my grandmothers hankies, the hankie bags (which used to hang on a hook in the bathroom, where we got one out before leaving the house, or when we got dressed each morning), did not survive the years, and I had totally forgotten about them until I saw your post. 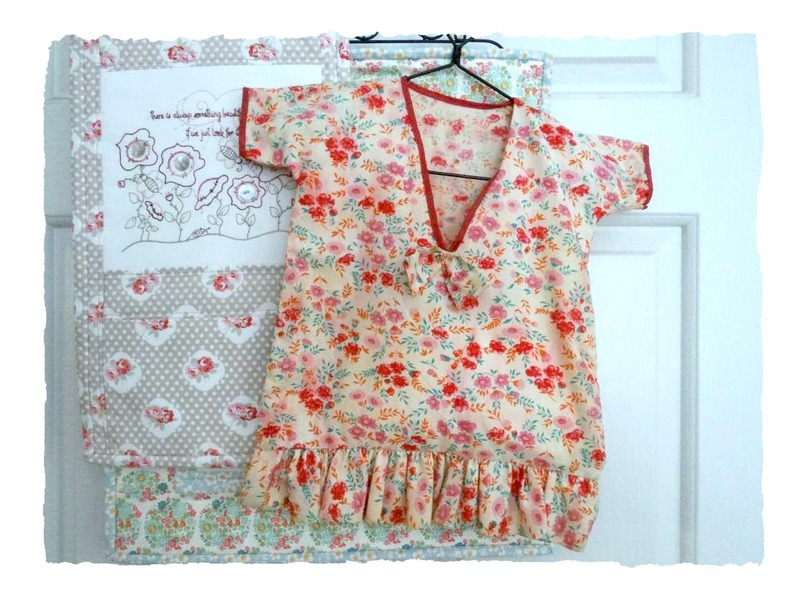 I foresee a lovely stitchery in the future utilizing some vintage handkerchiefs and an appropriate design. I will have to make myself one to hang in the cupboard for my hankies. A nicely ironed hankie is so much nicer than a tissue. My grandmother always had lavender in her hankie bag, and camphor in granddads hankie bag. We always knew where to put the hankies after ironing them, and where to go if we had a cold for a clean hankie. Thank you for dredging that memory from the recesses of my mind, I can still smell them, and the scent always went through the washing. Jenny, I have been thinking of you with the cyclone forming in the Coral Sea. I will be praying for your safety. I have a very sick friend up there plus a couple of cousins so I hope it makes landfall in a less populated area or an area not populated at all would be better. These things are unpredictable as we know and I am sure everyone up there knows the drill and is as prepared as possible. I arrived in Townsville the night before Cyclone Larry hit as I was visiting for my daughter's Uni graduation and I know how terrified I was all night in a strange city knowing a cyclone was going to hit the coast. Stay safe.